When the puck drops for the Ryerson Rams 2018-19 season, one player on the roster comes with a unique background. 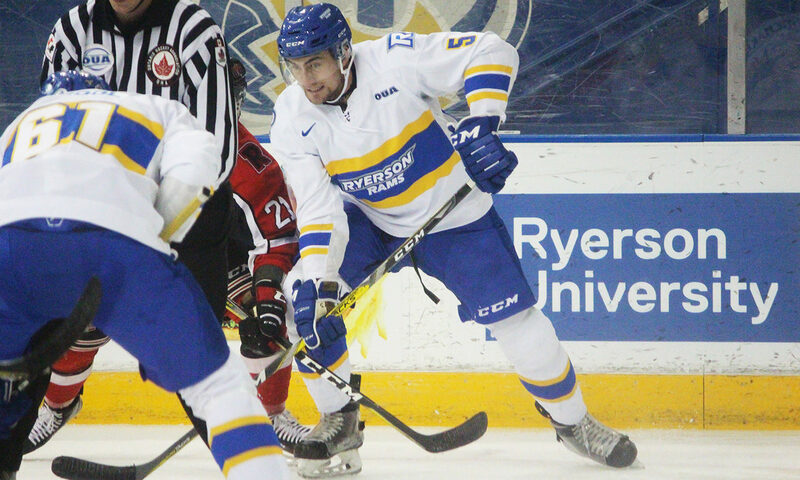 Mark Shoemaker is a new recruit for the Ryerson men’s hockey team. He played five seasons in the Ontario Hockey League (OHL) with the North Bay Battalion and the Guelph Storm. The defenceman was also a former National Hockey League (NHL) draft pick by the San Jose Sharks. Drafted in the sixth round of the 2016 NHL entry draft and placing 180th overall, Shoemaker spent two years under the watchful eye of the Sharks. Although he chose not to attend the draft, he said he was ecstatic when he heard the good news. Indeed, it was a tough journey to reach that position. 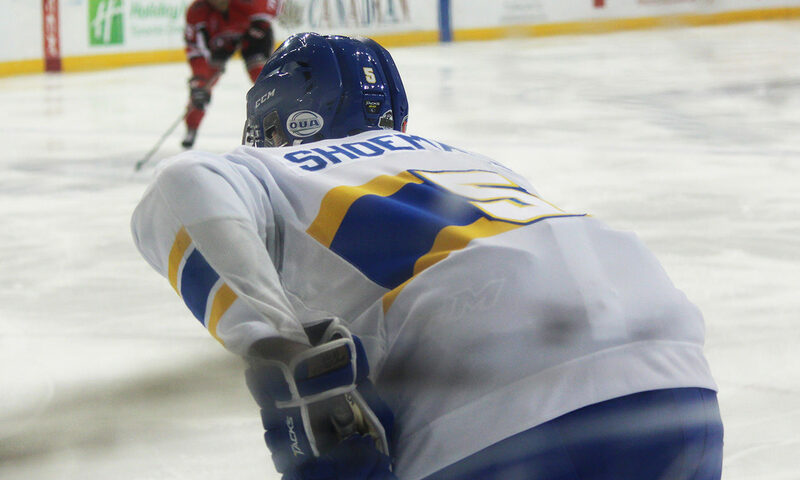 Prior to the NHL draft, Shoemaker was drafted by the Battalion in the 11th round of the 2013 OHL priority draft. As he described it, OHL players taken in the first six rounds have a good shot at an NHL career. In his case, those taken from the seventh round and later have significantly lower odds at making it to the big league. Despite having a small chance of making it, Shoemaker worked hard after the draft to earn a position in the OHL. After spending the 2013-14 season playing in triple-A hockey, North Bay gave him an opportunity to work his way up the roster. Shoemaker made the most of it and went on to have two solid seasons playing in a depth role. This put him on the Sharks’ radar despite not being listed on the draft projections, he said. In the next two years after San Jose picked him, he went on to attend two Sharks rookie camps that took place during the off-season. Shoemaker said he found the rookie camps to be a good learning experience. Shoemaker added that it was the most tiring week of his life, but nonetheless, the experience was enjoyable. Despite not making it past the Sharks rookie camp, Shoemaker always remained hopeful that he could make it to the NHL. Unfortunately for him, he had a few setbacks in his final OHL season. After being traded to the Guelph Storm in a move he was excited about, he experienced his worst statistical season to date, registering 10 points in 66 games played. The Sharks later elected not to give him a pro contract, which Shoemaker described as a tough pill to swallow. This made him re-eligible for the 2018 NHL draft, but his name wasn’t called on that occasion. Instead of letting the disappointment get to him, Shoemaker committed to playing for the Rams and studying in Ryerson’s business management program. Coming from a family with experience in the financial industry and a high interest in the subject, the choice to go to Ryerson was an easy one for him. 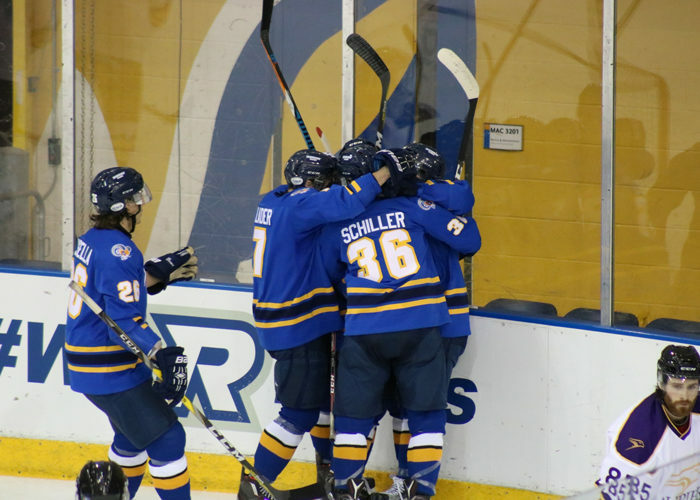 While Shoemaker was unable to get his shot at the NHL, Ryerson head coach Johnny Duco saw the untapped potential that could bring value to the Rams. As for Shoemaker, he was impressed with the team culture, attitude, and overall success that Duco described to him. He was also sold on the potential of the team’s championship aspirations, and felt that he could be a positive addition to continue the winning ways. He sees the 2018-19 season as both a chance to win a national title, and an opportunity for personal growth. “I feel like I still have a lot of room to grow and still have some potential,” Shoemaker said. “I feel like I can be a lot better than I am right now in a couple of years.” He added that he just wants to play well, compete hard, and enjoy his time. Similarly, Duco also feels that the 20-year-old defenceman can both develop as a student-athlete, and have an impact during his time at Ryerson. While his focus is currently on the Rams and improving his all-around play on the ice, Shoemaker still hopes to land a pro contract one day. Seeing his teammate Alex Basso get invited to the New York Rangers camp gives Shoemaker comfort in knowing that his goal is still achievable. While he may not be the first Rams player to have formerly spent time in the OHL, he knows firsthand the obstacles he had to overcome. He hopes that future players who end up in the same position take everything into consideration and stay optimistic about achieving their goals. The adversity of not getting signed by the Sharks put a chip on Shoemaker’s shoulder entering the Rams’ 2018-19 season. But, no matter what happens next, he said that he intends to give his all each night, and work towards making his dream become a reality. Michael Mazzei is the sports editor and a video producer for the Ryersonian. You can follow him on Twitter @MichaelMazzei3. C’s get degrees, or do they?